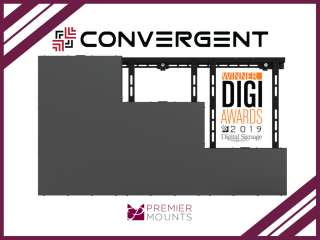 DSE 2019 will mark the official U.S. debut of Premier Mounts' Convergent Series of LED video wall mounts; the product launched in October 2018. In addition, the company will also showcase updates to its LMVS product lines. The new design includes additional built-in adjustment for super slim and sleek LCD video walls. There is also an additional adjustment feature in the mounting brackets that allows almost three times the previous adjustment capability and helps create ADA-compliant LCD video walls. A press-and-release function also allows for installation in recessed architecture and easy rear display maintenance throughout its lifecycle. The Convergent and LMVS products will be available for viewing at DSE 2019 in Booth 1918.